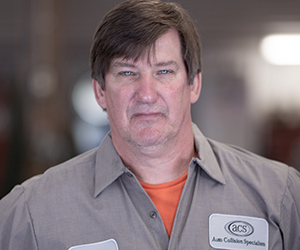 Chuck has been committed to providing the highest quality collision repairs since opening ACS in 1980. A true leader, Chuck treats his team and customers like family, with no exceptions. Chuck enjoys working on classic cars, traveling, and spending time with his family. Click here to read an interview with Chuck from an article in Hammer & Dolly. 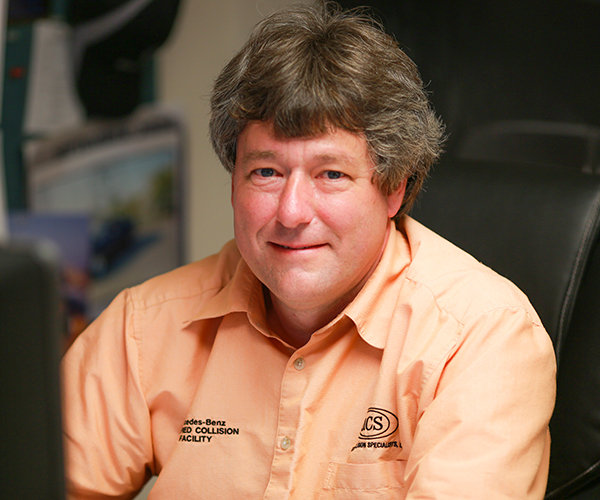 Since the beginning of ACS, Carey has been the backbone of the shop's administration and operations. She has been a major driving force in keeping the shop efficient and on the cutting edge. Her hobbies include: spending time with her grandchildren, gardening, traveling, walking, weight training, antiquing, and collecting stained glass. With over 19 years at ACS (5 years in the Detail department and 14 years in Paint, with some body work experience) Charles is an experienced and talented painter. Charles is Glasurit and Sikkens certified for automotive refinishing/paint. He also has Mercedes-Benz online training and BASF Mercedes-Benz certification. His hobbies include snowboarding, fly fishing, fly tying, poker, and spending time with his children. Dan graduated from Universal Technical Institute in Houston, TX. 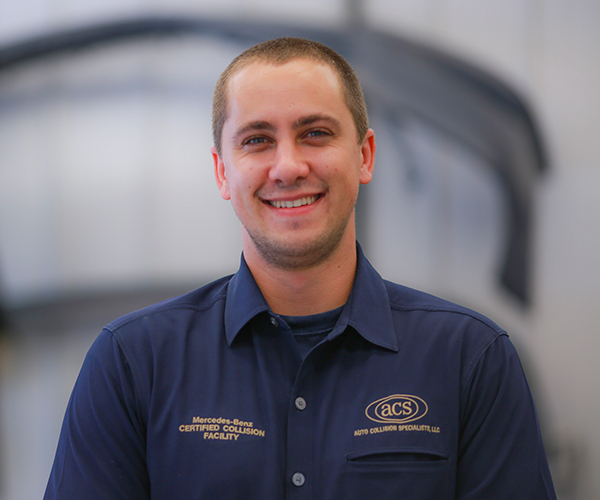 Since 2006, he has been one of the lead body technicians at ACS, and has furthered his training to become I-Car & ASE certified, a Mercedes-Benz Master Technician, and a Mercedes-Benz Structural Aluminum Certified welder. "I really enjoy what I do," Dan says, "but when I'm not working I love to spend time with my two kids and family." Dan also enjoys golf and motocross. 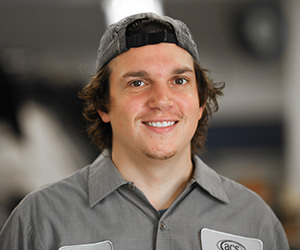 Andrew has spent 14 years at Auto Collision Specialists, 7 years in Detail and 5 in Paint. Andrew has completed Mercedes-Benz USA online training, Mercedes-Benz Standard of Excellence Detail training, and is Glasurit and Sikkens certified for paint. His hobbies include golf, snowboarding, hiking, going to the gym, and spending time with his daughter and family. Amanda is the first person customers talk to at ACS, and we cannot imagine a better person for the job. She is passionate about providing a fantastic, incomparable customer experience. She has been working in the automotive field for 19 years, with 6 years as a member of the ACS team. Her hobbies include concerts, the beach, sports, and spending time with her family. Colin has always been a "car guy." 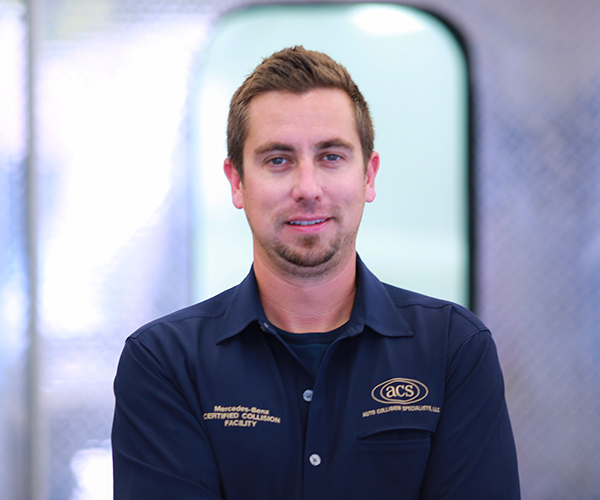 He has been working on cars professionally since 2000, with 6 years as an ACS team member. He is ASE & I-Car Certified, as well as Mercedes-Benz Star Certified after completing their coursework and putting in years of service. He enjoys working on anything with an engine. He is a dedicated family man, and he also served as a Military Policeman for the U.S. Army Reserves. Greg has 31 years of automotive industry experience. 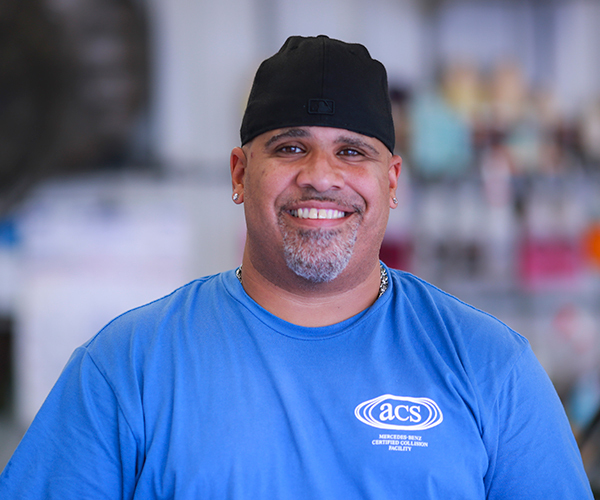 He loves working at ACS because of the tight-knit family atmosphere. He is an ASE Certified painter, and has completed numerous Mercedes-Benz training and certification courses, the 3M Skills Workshop, and Audatex Estimate Training. His favorite hobby is drag racing. 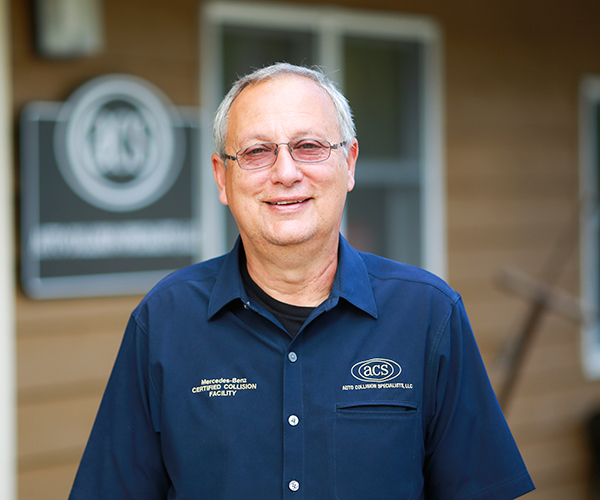 One of our long-time employees, with 35 years in the industry, Dave recently celebrated 27 years at ACS. He has held practically every position in the shop over the years. He has completed Mercedes-Benz Standards of Excellence training, is BASF Certified, and has I-Car and ASE Certifications. He enjoys spending time with his family, traveling, motorcycle touring, and working on classic cars. The quality and care that goes into Stephon's detail work is unparalleled. He has 14 years experience in the Automotive Detail industry. No matter the situation, Stephon always strives to go the extra mile. His hobbies include crewing/racing, Outlaw Promodifieds, 10.5 Outlaw Racecars, and martial arts (specifically Krav Maga). 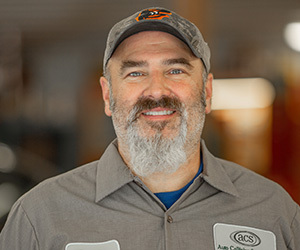 Richie's passion for the work he performs at ACS never goes unnoticed, and he says he loves the opportunity to work on luxury vehicles. He has completed Mercedes-Benz USA training and is Mercedes-Benz BASF Certified. He always steps up to the plate and has one goal at ACS: to always put his heart into what he does. He enjoys spending time with his family, going to movies, hanging out with his friends, and watching sports, especially football and cricket. 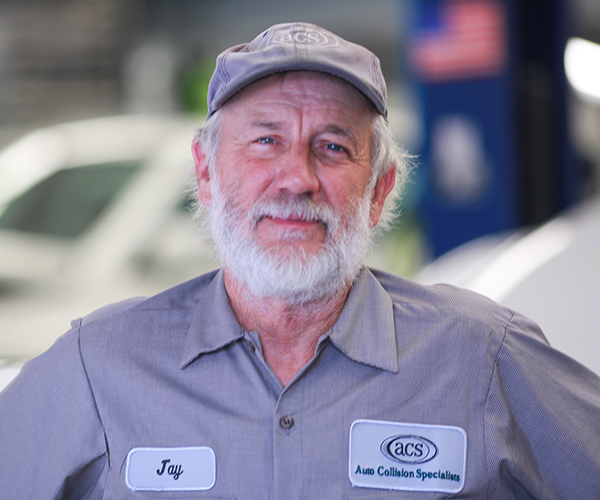 Jay has dedicated over 20 years of his 42 year automotive career to ACS, and we are more than thrilled to say that. He has been I-Car & ASE certified for 27 years, and Mercedes-Benz certified for 12 years. His love for classic and modern cars has always shown in his work. He enjoys playing with his grandchildren, running, biking, flying drones, and working on old bikes. For Keith, taking cars apart and putting them back together is what drives him. 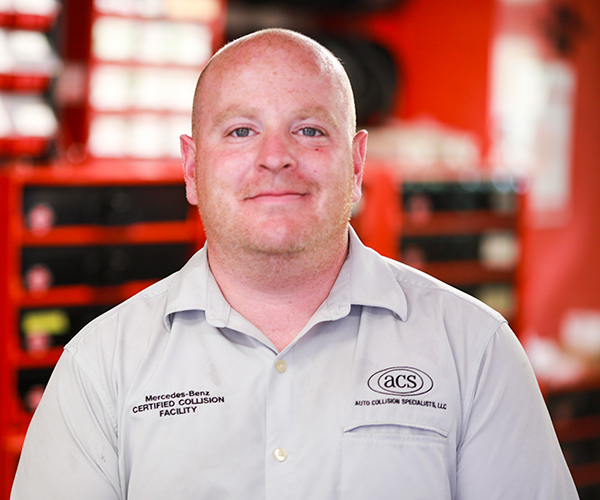 He is proud of his work at ACS, and is as passionate about providing quality repairs as a technician could be. 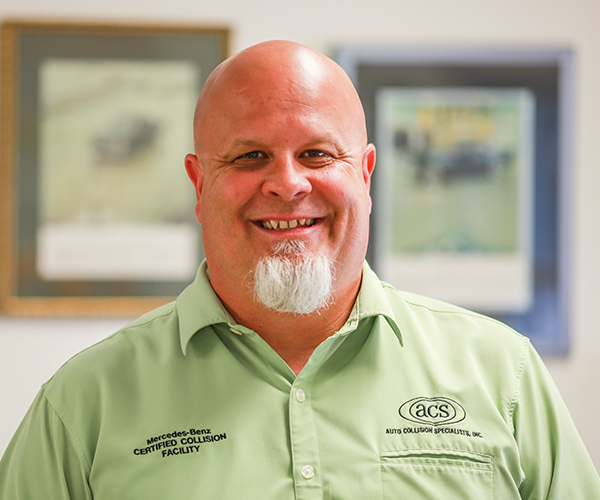 He is Mercedes-Benz Master Certified, I-Car and ASE Certified, and has worked with ACS for 10 years. He enjoys home brewing beer in his free time. 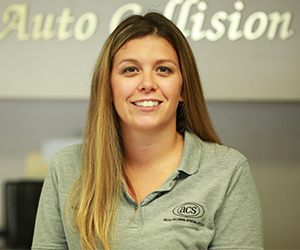 Jamie is an integral part of our collision repair team. His passion for cars started in high school and never stopped. With 32 years in auto repair, Jamie has acquired an impressive amount of industry certifications and recognition. To go along with his ASE Master certification, he is also certified by I-Car in steel sectioning and MIG welding. His hobbies include cooking, gardening, and poultry farming. Craig has been tinkering with cars his whole life. His passion has carried him into a long, successful career in collision repair. 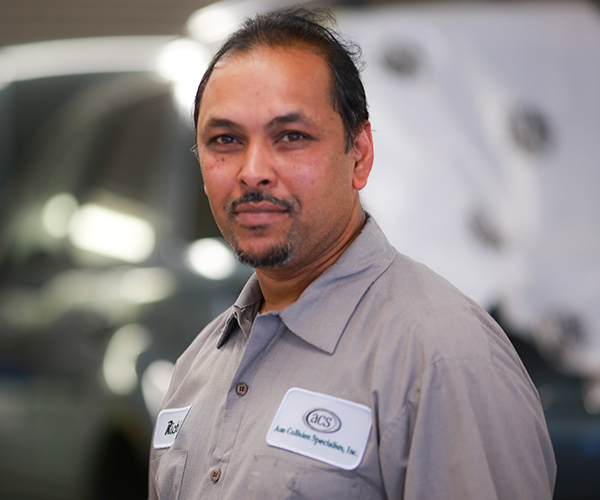 He has 40 years of professional experience as a certified I-Car and ASE technician. 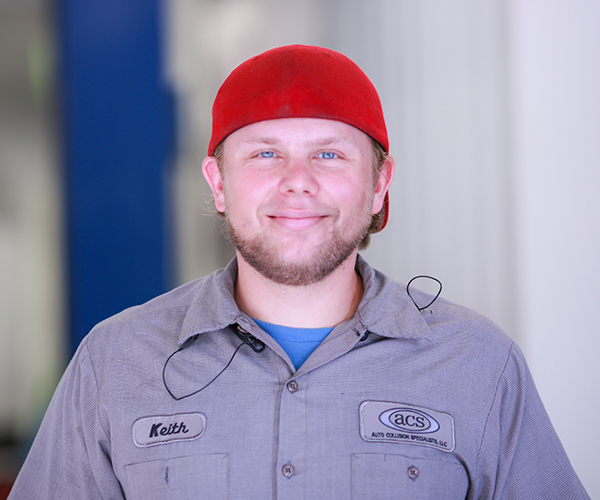 Craig’s dependability and winning personality has made him an invaluable component of our ACS team. In his spare time, he enjoys home improvements, working on hot rods, and spending time with his family. Trey has been working in the auto industry for 3 years. He enjoys working with all cars but has become particularly attached to BMW and Mercedes-Benz models. His passion for luxury vehicles has proved a good fit with our high-quality repairs. When he’s not working at the shop, Trey likes to skateboard, paint, draw, and tour Out-of-state breweries. 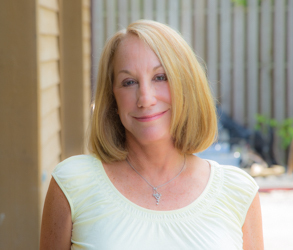 Cheryl is part of our skilled customer care and administrative office team. 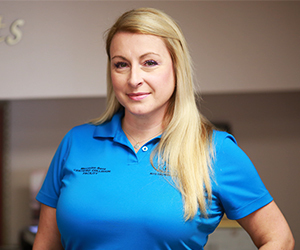 She understands that getting into an accident is stressful, and works to ensure that our customers have the most hassle-free, streamlined experience possible. Her hobbies include running, hiking and playing golf. She also loves to rehab old furniture. 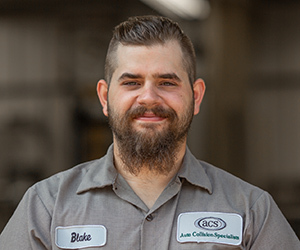 Blake has always been a car enthusiast and after 3 years working in auto repair, nothing has changed! 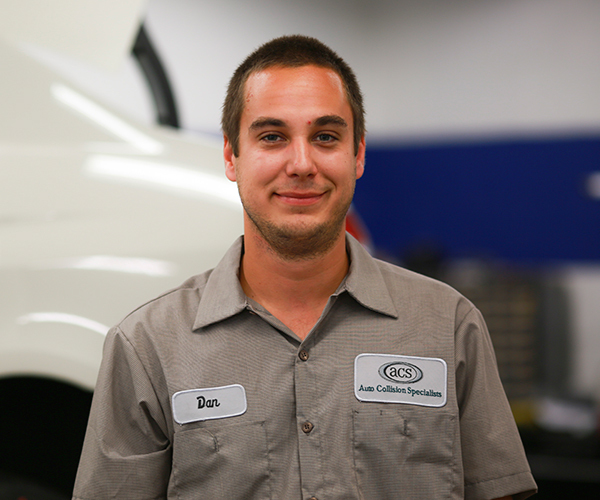 He loves repair work and enjoys spending time helping his family and friends with their vehicles. When Blake is not working on cars, he likes to stay active, playing football, baseball, camping, hiking, and of course, racing cars. Since it's humble beginning in 1980, ACS has been a leader in the collision repair industry. Learn about ACS' history and how the shop came to be the leader it is today!